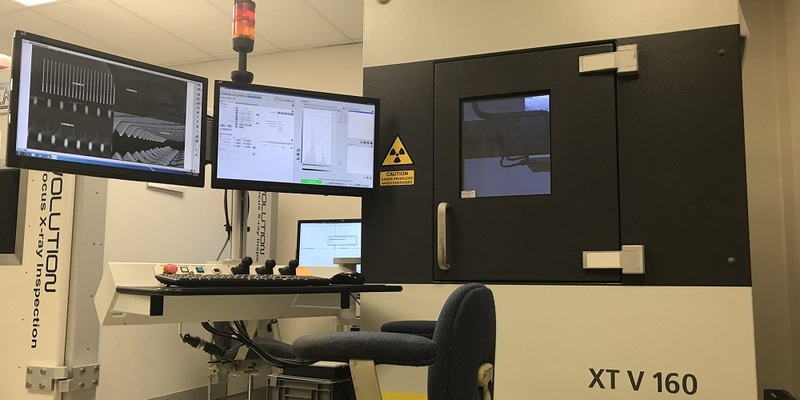 eal 3D X-ray with CT volume reconstruction allows 3D visualization and virtual cross-sections of circuit assemblies, solder joints, and components. CT X-ray is the best tool for many projects, such as failure analysis investigations, reverse engineering, void analysis and defect visualization. Contact PSI today and see if CT X-ray is the right strategy for your analysis needs. PSI's Nikon XT V 160 system with 3D volume reconstruction is specifically designed for inspection and visualization of electronic assemblies and components. Boasting 160kV power and , we can visualize hidden features and furtive anomalies with amazing clarity and perspective. CT X-ray can be performed destructively or non-destructively. For many samples, especially samples larger than a few inches, it is often necessary to excise the area of interest from the circuit assembly, to obtain the magnification and contrast necessary for a good scan. Obviously this method destroys the assembly in the process. However, Nikon's proprietary Xtract technology uses table rotation to allow X-ray scans of large, intact samples, with results that approximate those of normal (axial rotation) scans. The size of the board or sample, and the location of the target feature on the sample, will determine whether a particular board is a candidate for this method.